Everyone in New York thinks that it’s quicker to go to JFK than EWR (Newark Liberty International Airport) but it ain’t the case. 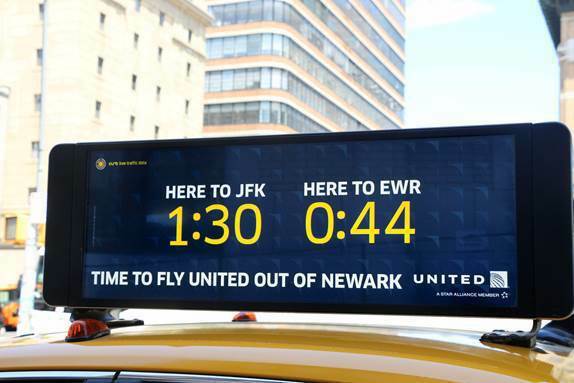 United wanted people to choose EWR, its New Jersey hub, so they sent real time traffic data to digital displays on New York taxis, which of course is how lots of people get to the airport. Real time traffic data is of intense interest to drivers. The Australian Traffic Network is real time on mainstream radio and TV. Call us on 9388 7844 to brainstorm or for rates. Here’s the full case study on the NY outdoor campaign; includes video.